Click here to get your library listed. An extension of the support library designed to facilitate the use of the action bar design pattern across all versions of Android with a single API. News Stand app makes the ActionBar not boring! A morphing toolbar that can expand/collapse at anytime. The Android Action Bar Style Generator allows you to easily create a simple, attractive and seamless custom action bar style for your Android application. It will generate all necessary nine patch assets plus associated XML drawables and styles which you can copy straight into your project. A helper to work with StatusBar and NavigationBar. Material CAB allows you to implement a customizable and flexible contextual action bar in your app. The traditional stock CAB on Android is limited to being placed at the top of your Activity, and the navigation drawer cannot go over it. This library lets you choose its exact location, and a toolbar is used allowing views to be be placed over and under it. Just a beautiful action bar. multiline-collapsingtoolbar is a replacement for CollapsingToolbarLayout from the Android Design Support Library which can deal with multiline titles in the expanded state. When collapsing the toolbar, the lower lines of the title fade away to leave only the top line visible. Header2ActionBar is a library which implements the fading action bar effect that can be seen in the new Play Music and Google Newspaper apps. MaterialPreferenceLibrary allows to have an ActionBar even on PreferenceActivity, even for pre-Honeycomb versions of Android. An Android custom animation on collapsing toolbar that looks like WhastApp Profile screen style. SherlockNavigationDrawer is the implementation of the latest Google UX component, Navigation Drawer, for ActionBarSherlock. It should work exactly as Google Drive app, It works with ActionBarSherlock for pre Honeycomb devices and above. It also use Fragments. Retractable Toolbar - it is an utility library that gives a retractable effect to your toolbar. Waterfall Toolbar is an Android version of Material Design's web component waterfall toolbar. Basically, what it does is dynamize an ordinary Toolbar, increasing and decreasing its shadow when an associated view is scrolled. A combination of custom CollapsibleToolbar and Collapsing Text to give you the same effect as App Bar Layout from the Design support library sans the use of a Toolbar. An Arc view for the android Toolbar or anywhere. Extended CollapsingToolbar that implements scrolling behaviour like in Google Play app. Android toolbar with layout direction support. A simple library to show a different style bar with changing animation. This is a Scrollable App Bar for Android. Android ActionBar Advanced Support Library for API v22, v21, v19. This will be a better one for all kinds of design. This library bundled a lot of design patterns in the advanced actionbar supports. An example project / library of animation-supported Toolbar widget. A contextual actionbar library with many customization options. 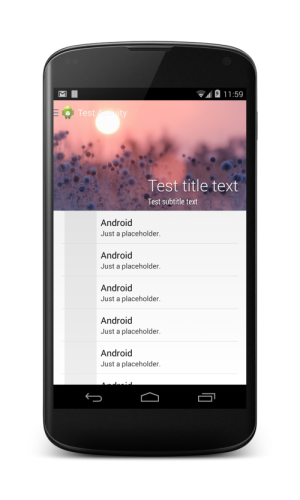 Android Toolbar with marqueeable title / subtitle. A Custom View to indicate multiple fragments with a triangular indicator. This Android library allows you to replace the drop down navigation list when the items in the list are needed to be grouped by sections. It was inspired from the Google I/O 2014 app how sessions are grouped in the ActionBar list.